The PWM output determines the spindle rotation speed of milling machines with high frequency spindles or the laser output for laser engraving or the deviation of the tool for our GranitoGrav module. The display of the S values in the NC programme can be balanced via the calibration function, i.e. the maximum and minimum S values will be set to the appropriate voltage. First enter the permissible area for the S values (speed or power level) below on the left. 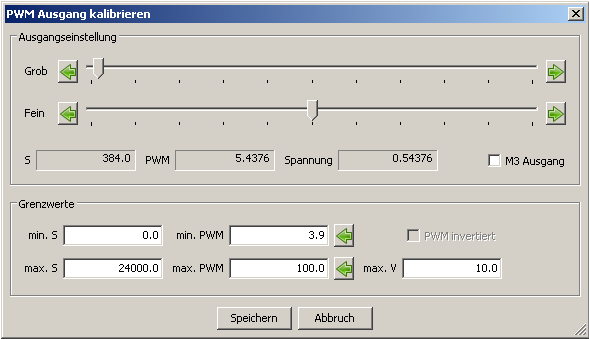 The values assigned for PWM output’s minimum and maximum duty cycle can be found in the middle column, in percentage. The value for the maximum speed below on the right serve only for control. The settings can be tested in the upper part of the window. When the M3 output is activated, the spindle with the displayed rotational speed should spin, or the displayed voltage should be able to measured in the analogue output. If these are not the same, you can align them by adjusting the values for minimum and maximum PWM. The arrow button on the right next to the PWM values overrides the value as currently set in the area above in the entry field on the left. The outputs cannot be directly tested during laser engraving because a stationary laser will burn a hole in the material. So the PWM setting has to be determined by a special test programme. This is described in the handbook on the laser unit.